Vikings Treasure is a NetEnt online video slot based on the Vikings theme. The hottest features of this slot are its top fixed jackpot of 10,000 coins, scatter payouts of up to x500, and free games with tripled wins. To play Vikings Treasure for real money, players will first activate as many or as few of its 15 paylines as they wish. Players can bet up to five coins per activated payline and choose from a coin denomination range of $0.02 to $0.50. This means that players can bet as little as $0.02 to as much as $32.50. The next step is to hit the Spin option, create winning combinations, unlock bonus features, and win big prizes. Players can also alter the slot’s settings to customize the gaming experience as per their tastes. They can turn on/off the audio effects or background music, alter the graphics quality, and view the game history. They can also use the slot’s Autoplay Feature if they do not want to spin the reels manually. People have always been fascinated with tales related to the Vikings, who travelled far into the East, exploring the North Atlantic seas, settling down in Greeland, and discovering America centuries before Columbus did. The slot challenges players to experience the treasure hunting adventure of the Vikings. The sound effects, graphics, and animations are excellent, delivering the authentic Vikings experience. The reels feature icons of ships, helmets, shields, Viking women, axes, and other thematic icons. The Viking icon serves as the wild, substituting for all other icons on the reels and helping players finish winning combinations. But players should note that the Vikings icon cannot substitute for the scatter icon to help players unlock the free spins round. If players land a combination of five Viking wild icons along an active payline, they can take home the top fixed jackpot of 10,000 coins. The Gold Treasure icon is the scatter, which pays even if it does not land along an active payline. If players land combinations of 2, 3, 4, or 5 symbols anywhere on the reels, they will win scatter payouts of x2, x5, x25, and x500, respectively. To unlock the free spins round, players need to land at least three Gold Treasure scatter icons anywhere on the reels. Players will immediately receive 15 free games with tripled wins. The good news is that players can re-activate this feature while playing a free game. 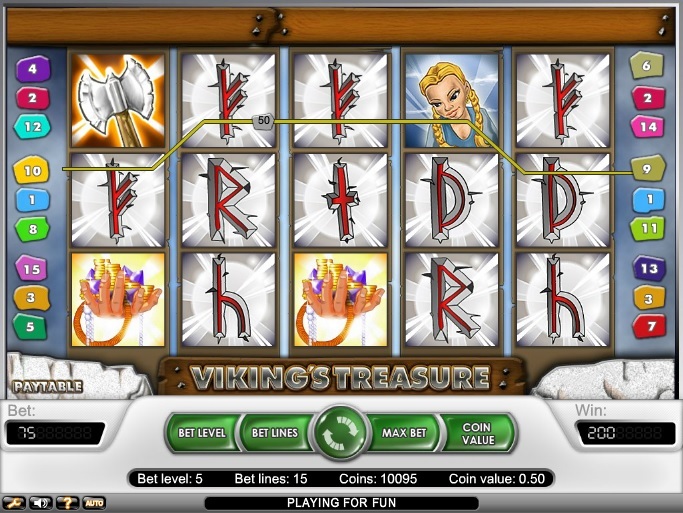 Viking Treasure is indeed a slot worth playing not just for its attractive theme, but also for its huge win potential. The slot’s Skill Stop Feature almost transforms it into a game of skill, allowing players to stop the reels in mid spin to capture a winning combination. Viking Treasure is available at any NetEnt online casino.